Minh’s Foods, a division of Schwan Food Company and a processor of Asian Inspired whole frozen foods, planned for future growth with the expansion of their existing plant. 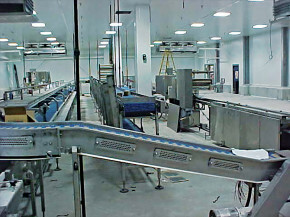 The SSi design-build team planned the Deer Park, Texas based 70,000 square-foot United States Department of Agriculture (USDA) regulated egg roll manufacturing addition. Already poor soil conditions, coupled with 30 inches of rain from tropical storm Allison, left select fill suppliers with nothing but wet materials. Drawing on ingenuity, SSi utilized a calcium sulfate by-product from Houston’s oil refineries as fill material. The project built of galvanized structural steel was completed on time and on budget. *Ingenuity – Reclamation of calcium sulfate by-product as fill material. *An ammonia refrigeration system with single station computerized control was incorporated as another modernization feature.